What Sort of Place is Columbia? Colombia is one of the most dangerous countries in the world. Colombia has been wracked by political violence for 150 years. The "Thousand Day War", at the beginning of the 20th century, between adherents of the two major political parties claimed 300,000 victims. Between 1948 and the late 1950s, Colombia again fought a civil war that killed an estimated 200,000 people. In the intervening periods blood feuds between supporters of the two main parties-the Liberals and the Conservatives-regularly cost many lives. 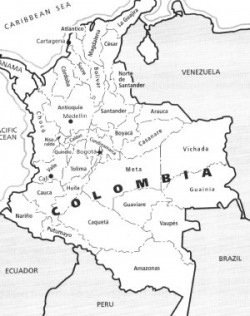 A compact to share political power between the ruling groups in both political parties, brought the worst violence to an end in 1958 but effectively shut ordinary Colombians out of the political process.